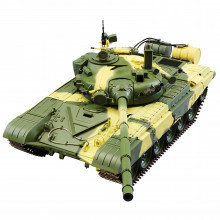 Build and Drive the Radio-controlled T-72 Tank. Whether you're fascinated by classic tanks or are left in awe by the wonder of warships and fighter planes, you're sure to find the perfect models to build in our collection. All out models come with great detail, authentic color schemes and weaponry details that ensure your model tanks and model planes really look the part. Start your military models collection with a historic Spitfire model or any other option from our selection of military model aircraft. Learn more about the history of conflicts, the development of the engineering used to make these incredible machines, and build your own replicas from scratch to get a feel for what they were like. Our military model tanks come in various shapes and sizes, detailing the history and evolution of this ultimate fighting machine. Collect the great tanks from history for a display to be proud of today. We also stock a selection of model planes, trains and cars too - so you can always expand your collection as your modeling skills grow.